Loosely translated, "sparverius" is latin for "relating to a sparrow". This alludes to the American Kestrel's old common name of "Sparrow Hawk". In fact, this raptor is not a hawk (it is a falcon) and its diet consists of beetles, butterflies, crickets, dragonflies, grasshoppers, small mammals, small birds, reptiles and amphibians. The bird in this photo had just retrieved a cricket from the grass and flew to the fence post to eat it. 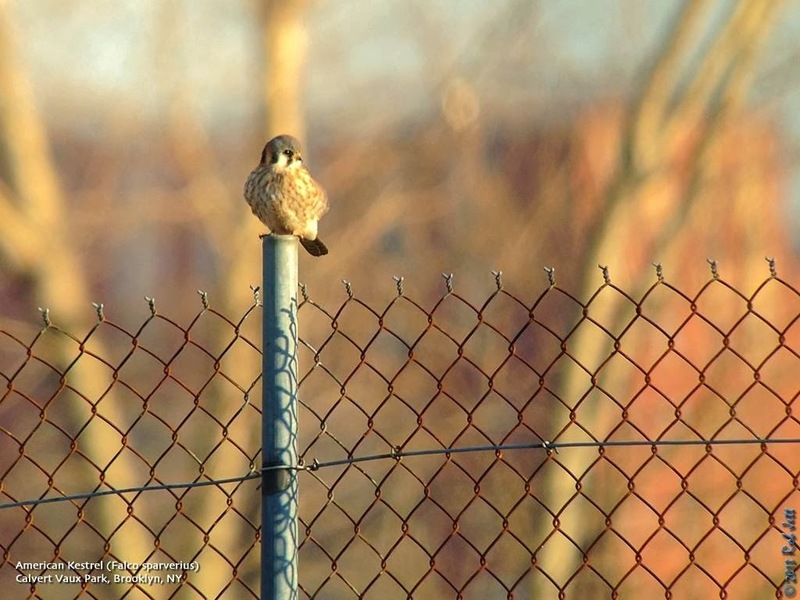 This feisty, tiny falcon is common around NYC and its ability to see in the ultraviolet spectrum helps it hunt rodents, whose urine reflects ultraviolet light. Greetings. This is the New York Rare Bird Alert for Thursday, November 28th, at 8:00pm. The highlights of today's tape are SNOWY OWLS, Pelagic Trip Results including NORTHERN FULMAR, WESTERN KINGBIRD, KING EIDER, LARK SPARROW, and RED-HEADED WOODPECKER. Suddenly we find ourselves in the midst of a fairly extensive SNOWY OWL invasion, with mostly young birds showing up especially at coastal locations, but also at other areas where they could mostly still be in transit. It may be awhile before the owls are settled in and we can determine the extent of the incursion, but we should remind birders now to please not disturb these Snowys; they are here due to stressful conditions farther north, and we should not add further to their stress. Owls have been showing up at some traditional locations, such as singles recently at Jones Beach West End and Floyd Bennett Field on western Long Island, with up to four along Dune Road, west of Shinnecock Inlet, and up to three around Napeague Harbor on eastern Long Island. They will also presumably show up at sites from Breezy Point to Smith Point Park as well as scattered inland locations. One was this week along the Westchester coast, and two have even been in the Black Dirt region of Orange County, the beginning of an exciting and perhaps even unprecedented event. The See Life Paulagics pelagic trip, with the Captain Lou fleet out of Freeport last Saturday, enjoying a nice ride out about 40 miles but a rougher return in strong winds, had great views of a few of the six NORTHERN FULMARS seen and various gulls in the chum slick, including three ICELAND GULLS, two LESSER BLACK-BACKED GULLS, and 26 BLACK-LEGGED KITTIWAKES. The GREAT SHEARWATER, one of five seen, also visited the slick, and other birds noted included singles of CORY'S SHEARWATER and SOOTY SHEARWATER, and 550 NORTHERN GANNETS. A WESTERN KINGBIRD was seen off Cove Hollow Road in East Hampton on Monday, that same day finding a drake KING EIDER in a large scoter and eider flock off the Camp Hero Overlook at Montauk Point State Park. Also at Montauk, two ICELAND GULLS were around the Montauk Harbor Inlet, and at Napeague the LESSER BLACK-BACKED GULL at Lazy Point was seen again on Monday. SHORT-EARED OWL has also been present at Napeague, and two immature BALD EAGLES were spotted at Fort Pond in Montauk Monday. A Selasphorus hummingbird, unidentified to species, was reported from Bryant Park in Manhattan last Saturday. A LARK SPARROW found Monday at Floyd Bennett Field in Brooklyn was still around at the berm just east of the cricket field today. 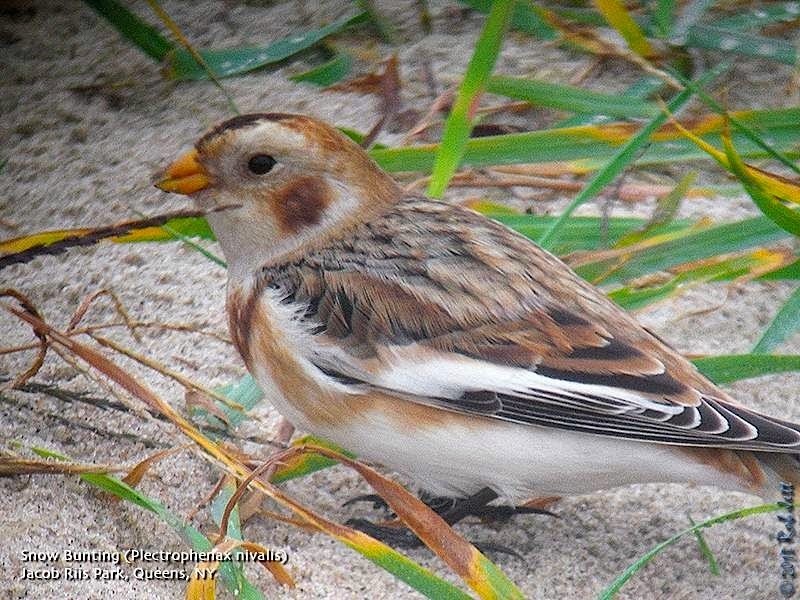 A LAPLAND LONGSPUR was at Heckscher State Park, field 7, last Sunday. Single LESSER BLACK-BACKED GULLS were at Jones Beach field 6 last Sunday, off Gravesend Bay in Brooklyn Wednesday, and at Breezy Point today. Single ORANGE-CROWNED WARBLERS were in Prospect Park in Brooklyn Tuesday and at Oakland Lake in Queens today. At least one RED-HEADED WOODPECKER was still around Turtle Cove at Pelham Bay Park in the Bronx last weekend, and two RED-NECKED GREBES were still off Playland Park in Rye on Tuesday. This service is sponsored by the Linnaean Society of New York and the National Audubon Society. Thank you for calling, and Happy Thanksgiving! 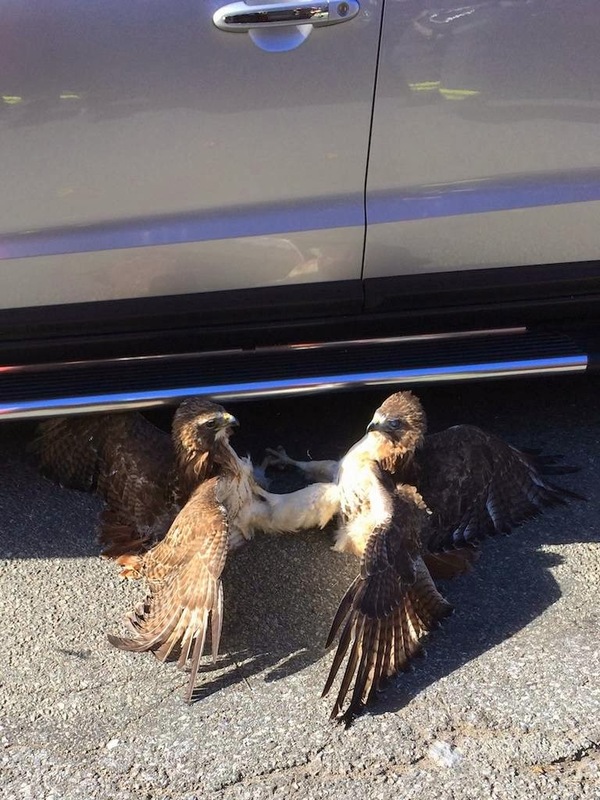 A friend of mine who is a fireman, saw these two hawks fall out of the sky locked together. This happened by the Foodtown on MacDonald Avenue. The hawks didn't seem to be able to separate, and the firemen somehow helped them to disentangle. They then flew off. The location she describes is just outside of Brooklyn's Green-Wood Cemetery and about 1/4 away from last year's nest tree. This is not necessarily real battle. Red-tailed Hawks, and several other raptor species, will engage in talon grappling as a form of courtship or pair bonding. I've witnessed it many times, especially during the Winter months as the pair prepares to enter their breeding season. Around Brooklyn they usually begin deciding on the nest site, or preparing the previous year's nest, by January. Here's a link to a section in Charles R. Preston's book "Red-tailed Hawks" about this behavior. Saturday seemed like a good day ride the "F" train to Stillwell Avenue for some coastal birding at Coney Island. Peter Colen joined me. There were strong gusts blowing in from the North, but the amusement parks and tall buildings parallel to the boardwalk acted as a windbreak, screening the sand from the arctic blast. The water from the newly renovated fishing pier seemed relatively calm compared to the whitecaps farther to the South and closer to Breezy Point. 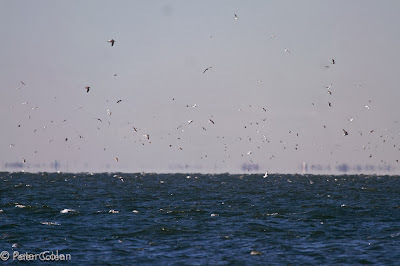 Tens of thousands of gulls were feeding on some type of bait fish. Masses of mostly white animals slowly drifted into the wind like flakes in a snow globe. We counted several Northern Gannets among the more common gulls. The annual overwintering Long-tailed Duck flocks haven't arrived and we only counted a small number of these striking, black, white and brown waterfowl. A flock of over 50 Sanderlings rested at the end of a rock jetty to the West of the Stillwell bathhouse. We continued walking down the boardwalk to the Western-most jetty where we ran into Bobbi, Dennis and Kristin. They also had the idea to look for any unusual seabirds or seaducks carried in on the strong North winds. I asked if they'd seen any Purple Sandpipers. They hadn't, so I walked to the edge of the jetty and started to step up onto one of the boulders. A Purple Sandpiper immediately popped up from his hiding place between the green draped rocks. A second one was a few feet to his left. Both Common and Red-throated Loons were diving for fish in the bay between the jetty and Sea Gate. 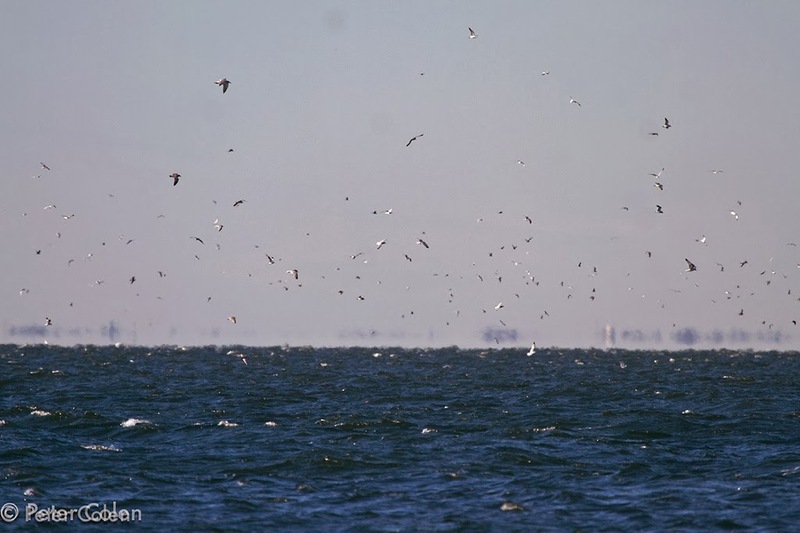 It was nearly impossible to pick out any unusual gulls in the overwhelming mass of birds dominating the horizon. Eventually Peter and I gave up and decided to walk North, to Coney Island Creek Park to look for Snow Buntings. By the time we arrived at the edge of Gravesend Bay, the wind seemed to have died down a little. We walked a few hundred yards to the West, where a tiny section of dune habitat is still relatively intact. 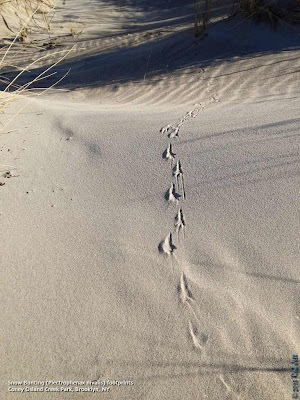 I decided the edge of the dunes would be a more likely place to find Snow Buntings given its protection from the wind and the availability of seeds. My hunch paid off as a bunting scurried away from us and hid behind some vegetation. I called the bird in and a second one joined him. Peter has some very nice photos on his website here. 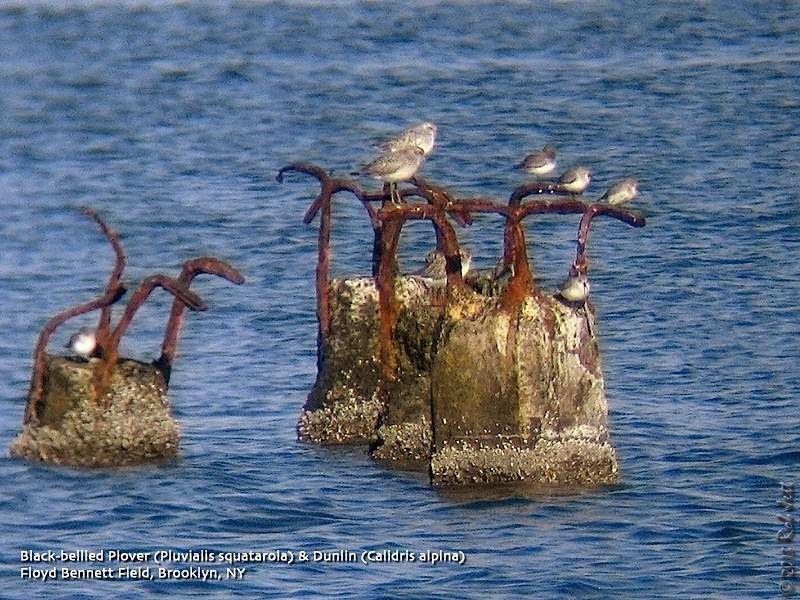 After watching the birds for a few minutes we continued heading into Coney Island Creek to look for gulls and waterfowl. 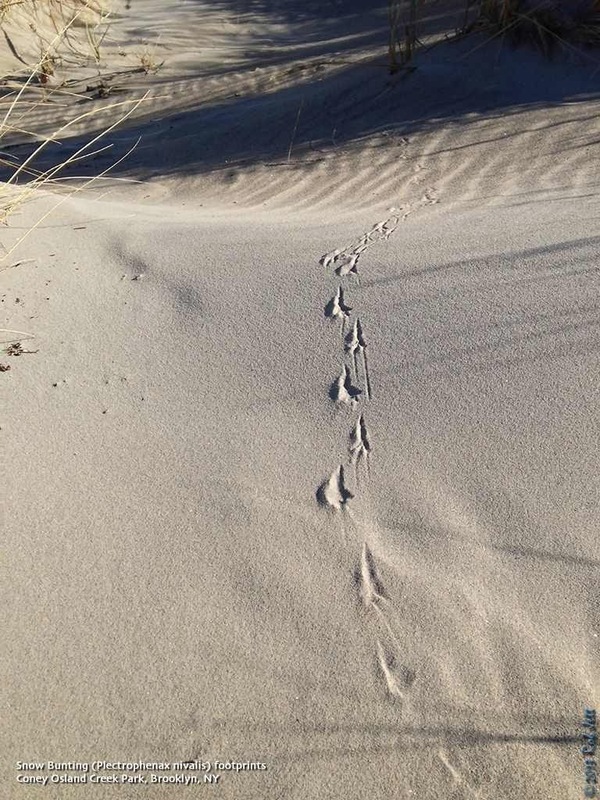 Along the way I spotted these tracks left by one of the Snow Buntings. I like how the "older" tracks on the downslope of the dune are disintegrating from wind action. A lone cormorant and a mixed flock of Herring, Ring-billed and Great Black-backed Gulls were gorging themselves on a windfall of bait fish near the creek's old yellow submarine. Long, thin and silvery, I said to Peter that they looked like eels. After examining his photos and doing a little research online, I feel fairly certain that they were Sand Eels. Here's a good piece on the bait fish of Long Island waters. Since 1991, I have been running New York Environmental Law and Justice Project as an independent, public interest legal organization, absolutely committed to the principles of environmental justice. Today, I am writing to ask for your financial support, to help the Law Project continue serving people whose rights to live, work, play and prosper in a safe and healthy environment have been historically undermined in our legal system. Over the past two decades, the Law Project has zealously advocated on behalf of people whose communities bear disproportionate environmental burdens, and whose interests are systematically disregarded in land use and development decisions. We have taken on work that would otherwise fall through the cracks, carving out a niche between direct legal services and larger-scale impact litigation undertaken by national organizations. Often on a shoestring budget, the Law Project has been able to survive through thick and thin. For this, we owe a great deal of gratitude to the collective spirit of the environmental justice movement, and the most incredible and dedicated group of like-minded lawyers, legal workers, scientists, organizers, activists, academics, and students, who have freely given the Law Project so much of their time and expertise through the years. Last week, we filed a lawsuit against the New York City Housing Authority, on behalf of over 400 named Manhattan public housing residents, to prevent NYCHA from moving forward with plans to develop luxury housing on historic parks and open spaces at 8 Manhattan public housing developments. Click here for Digital Copies of the Lawsuit Documents. This lawsuit marks the culmination of work that began early in 2013 - when we first met the intrepid, inspiring resident leaders of Alfred E. Smith Houses - and quickly became a predominant campaign for us during the past year. Throughout this process, the Law Project worked in close collaboration with co-counsel Urban Justice Center and special counsel Hon. Karen S. Smith, J.S.C. (retired); community organizations, such as GOLES (Good Old Lower East Side) and Community Voices Heard; and planning experts, including Professor Thomas Angotti, Director of the Hunter College Center for Community Planning & Development, and Professor Ronald Shiffman, Director Emeritus of Pratt Institute Center for Community and Environmental Development. We are extremely proud to be able to stand with the residents of 5 of the 8 targeted NYCHA developments; and stand up against the Bloomberg administration's desperate, last-minute attempt to subvert environmental review requirements while giving away public land for private luxury housing. But we need to raise money in order to continue taking these stands. So, I am asking for your donation. Any amount, whether $5, $10, or $100, will help tremendously with our operating costs, since we do not presently rely on grants from foundations or government programs. Simply click here to make a donation. Greetings. This is the New York Rare Bird Alert for Friday, November 22nd 2013 at 7pm. The highlights of today's tape are ASH-THROATED FLYCATCHER, WESTERN KINGBIRD, WESTERN TANAGER, EURASIAN WIGEON, HUDSONIAN GODWIT, RED-NECKED GREBE, ORANGE-CROWNED WARBLER and RED-HEADED WOODPECKER. On Saturday morning an ASH-THROATED FLYCATCHER was spotted at Jones Beach West End where it spent the day and was well photographed around the eastern exit of the West End 2 parking lot and adjacent median. The bird could not be relocated there Sunday. However, the WESTERN KINGBIRD, not seen at Captree State Park since the previous Monday, was spotted there again on Saturday and viewed by many on Sunday in the swale just north of the upper parking lot. It occurred there again Monday but apparently not since. Out on the north fork two WESTERN KINGBIRDS appeared together on Sunday in Cutchogue in a field on the north side of Oregon Road just east of Cox's Lane and continued at that location at least to Tuesday. Perhaps the most surprising though was the immature or female type WESTERN TANAGER photographed eating berries Wednesday in Prospect Park on the south side of Breeze Hill. Subsequent to being identified from the photos the tanager could unfortunately not be relocated. A few EURASIAN WIGEON continue in the area. A drake was seen again yesterday on the East Pond at Jamaica Bay Wildlife Refuge where shorebirds during the week have featured WHITE-RUMPED, SEMIPALMATED and PECTORAL SANDPIPERS and where over 800 SNOW GOOSE on the pond have included 6 blue forms. Other EURASIAN WIGEON were noted yesterday at Mill Pond in Sayville and on the lake at Long Island Country Club in Eastport. An injured HUDSONIAN GODWIT seen at Sagg Pond south of Bridgehampton on Thursday may have been the same one seen earlier in the week near Shinnecock and previously in the New Jersey Meadowlands complex. Also watch for possibly continuing MARBLED GODWITS along Dune Road west of Cupsogue County Park. RED-HEADED WOODPECKERS at Pelham Bay Park recently included one at Hunter's Island Saturday and 2 near Turtle Cove on Monday. A CACKLING GOOSE was still at Van Cortlandt Park in The Bronx Saturday. A count of RUSTY BLACKBIRDS there reaching 25 or more. An ORANGE-CROWNED WARBLER was in Central Park Monday and a few late records this week included both WHITE-EYED VIREO in Babylon Wednesday and a couple of BLUE-HEADED VIREOS, a few OVENBIRDS and a BLACK-THROATED GREEN WARBLER in Prospect Park on Thursday. Two RED-NECKED GREBES were off Playland Park in Rye on Saturday. There are still a few spaces left on Saturday's pelagic trip out of Freeport Long Island. If you are interested call (215) 234-6805 for more information. 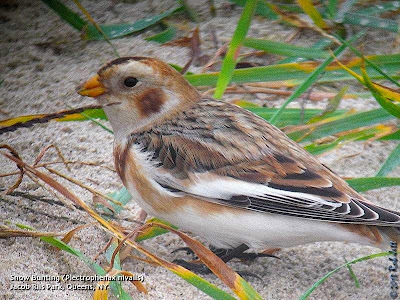 Breeding in the high Arctic, from Scandinavia, Iceland and parts of northern Scotland, through Russia and Siberia, to Alaska, Canada and Greenland, the Snow Bunting's Winter range includes coastal New York City. In Brooklyn during the Winter months look for flocks of this beautiful bird of the longspur family at Coney Island Creek, Plum Beach, Marine Park, Floyd Bennett Field and Dead Horse Bay. Gray wolves are icons of wild America, but the Obama administration is on the verge of stripping most of them of their protections under the Endangered Species Act. This would be catastrophic. Send a letter to the Secretary of the Interior from the Sierra Club's website here. Guides: NYC Audubon Naturalists or Urban Park Rangers With the Van Cortlandt Park Conservancy, NYC Department of Parks and Recreation, and Urban Park Rangers. Meet at Van Cortlandt Nature Center. The history of birding and Van Cortlandt Park are inseparable. Influential birders such as Roger Tory Peterson and Allan D. Cruickshank got their starts on Van Cortlandt’s ecologically diverse grounds. These walks celebrate the tradition set forth by these great ornithologists. Participants will look for various species of residents and migrants and discuss a wide range of avian topics. Guide: Gabriel Willow Come explore the lovely coves and rocky outcroppings of Pelham Bay Park, looking for wintering ducks, migrating raptors, and more. Bring lunch, water, and binoculars. Transport by passenger van included. Sundays, September 1 - November 24, 10-11am Guides: NYC Audubon Offered by the Central Park Conservancy Meet at the Dana Discovery Center (inside the Park at 110th Street between Lenox and Fifth Avenues). Bring the kids and visit one of New York City’s richest bird habitats. Learn as a family how to spot and identify our feathered neighbors in their natural surroundings. Binoculars can be borrowed from the Visitor Center. For weather cancellation information, call 212-860-1370. Limited to 20. Age 5 and up. Free. Saturday, November 23, 2013, 2:00 p.m. to 4:00 p.m.
Past and present blend as one at Conference House Park, where history stretches back thousands of years from the seasonal occupation of the Lenape to the arrival of the Dutch and English. Participants will observe the geology of the area and look for what the debris at the high tide line has to reveal. Meet at the parking lot on the left, at the end of Hylan Boulevard. Sunday, November 24, 2013, 11 a.m. to 1 p.m. This is a 4-mile loop walk along the converging trails through the lovely woods of LaTourette Park. This time we’re meeting at Meisner and Rockland Avenues by the stone dam at the Bluebelt pond. We’ll pass Buttonbush swamp and a grove of unique Persimmon trees. This hike is covered in Secret Places of Staten Island by Bruce Kershner (Kendall/Hunt, 1998). Rain postpones the event to the same time on Sunday, December 1. Greetings. This is the New York Rare Bird Alert for Friday, November 15th 2013 at 7pm. The highlights of today's tape are WESTERN KINGBIRD, NORTHERN SHRIKE, MARBLED GODWIT, HARLEQUIN DUCK, EURASIAN WIGEON, PHILADELPHIA VIREO, DICKCISSEL, RED-HEADED WOODPECKER and incoming owls. A decent week for November perhaps the highlight was the bright WESTERN KINGBIRD found Saturday at Captree State Park. 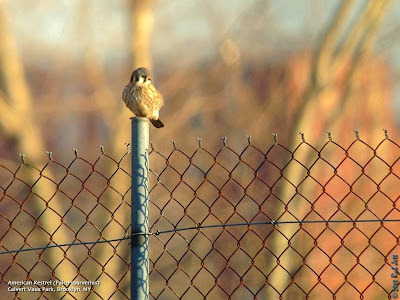 This bird hung around the periphery of the upper parking lot at Captree at least to Monday. There were no weekend sightings of the Jones Beach West End NORTHERN SHRIKE but another Northern was spotted out east Monday along Crassen Boulevard in the Lazy Point section of East Hampton. A couple of interesting passerines in Central Park were a late PHILADELPHIA VIREO photographed in the Ramble Saturday and a DICKCISSEL visiting the Pinetum near West 86th Street on Wednesday. A decent flight along the south shore of Long Island Wednesday witnessed at various sites including Jones Beach West End and Fort Tilden besides large numbers of RED-WINGED BLACKBIRDS and AMERICAN ROBINS like other recent flights also produced some AMERICAN PIPITS, EASTERN BLUEBIRDS, RUSTY BLACKBIRDS and PURPLE FINCHES with some SNOW BUNTINGS now joining in. An ORANGE-CROWNED WARBLER was also spotted at Zach's Bay at Jones Beach with a VESPER SPARROW at Fort Tilden. Among the recent late landbirds have been BLUE-HEADED VIREO and NASHVILLE and BLACK-AND-WHITE WARBLERS while now arriving are AMERICAN TREE and FOX SPARROWS. NELSON'S SPARROWS in diminished numbers do persist at a few coastal sites. 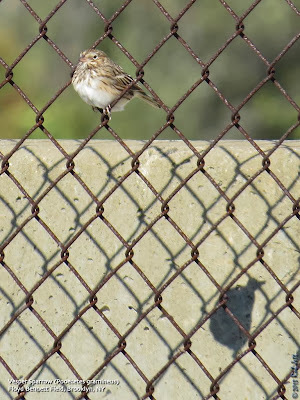 Fifty-three AMERICAN PIPITS were counted on the Van Cortlandt Park Parade Ground last Saturday. RED-HEADED WOODPECKERS during the week included an immature in Prospect Park to at least Tuesday, 2 still at Pelham Bay Park's Turtle Cove Wednesday, 1 still at Muttontown Preserve Monday and one at Marine Park in Brooklyn Thursday. A MARBLED GODWIT was still at Pike's Beach just east of Cupsogue County Park in Westhampton Dunes Sunday seen from the bay side viewing platform along with single FORSTER'S and ROYAL TERNS. A nice high tide gathering of roosting shorebirds on the wharf at the boat basin next to the Point Lookout waterworks on Saturday included 220 RED KNOTS among several hundred DUNLINS, some BLACK-BELLIED PLOVERS and 2 RUDDY TURNSTONES. This site is the first bay side entrance after turning west on Lido Boulevard from the loop causeway. At the Point Lookout Town Park across from the loop causeway a drake HARLEQUIN DUCK joined 18 COMMON EIDER at the westernmost of the 3 Point Lookout jetties on Saturday. Offshore there were also hundreds of NORTHERN GANNETS and at one point in a large feeding frenzy off Jones Inlet large numbers of Gannets have been present recently all along the south shore of Long Island producing counts of one-thousand plus at Smith Point County Park in Shirley Saturday and 750 off Jones Beach Wednesday. A good number of LAUGHING GULLS were also still off Jones Beach field 6 on Saturday. As waterfowl variety increases so do the number of EURASIAN WIGEONS. Last Saturday 3 were reported from Mill Pond in Sayville, a drake and 2 females, and another drake was on Patchogue Lake. A CACKLING GOOSE remained at Van Cortlandt Park at last to Monday and another was on Baisley Pond in Queens Sunday. Forty-five COMMON EIDER were at Shinnecock Inlet Saturday. Owl variety is also on the increase. A LONG-EARED appeared in Coney Island Brooklyn Wednesday, a SHORT-EARED was at Smith Point County Park in Shirley Saturday and a NORTHERN SAW-WHET OWL visited Central Park Thursday. A BARN OWL continues to been seen in a box on the north side of Big John's Pond viewed from the bird blind at Jamaica Bay Wildlife Refuge. But while at the bay tell them again to get the West Pond breach repaired. A BLACK VULTURE was seen over Greenport on the north fork of Long Island last Sunday and a white-winged gull, probably GLAUCOUS GULL, was at Mattituck Inlet that day. Red-headed Woodpeckers nest North of New York City in lowland areas of New York State and are generally seen in small numbers in the Spring and Fall during their short-range migration. 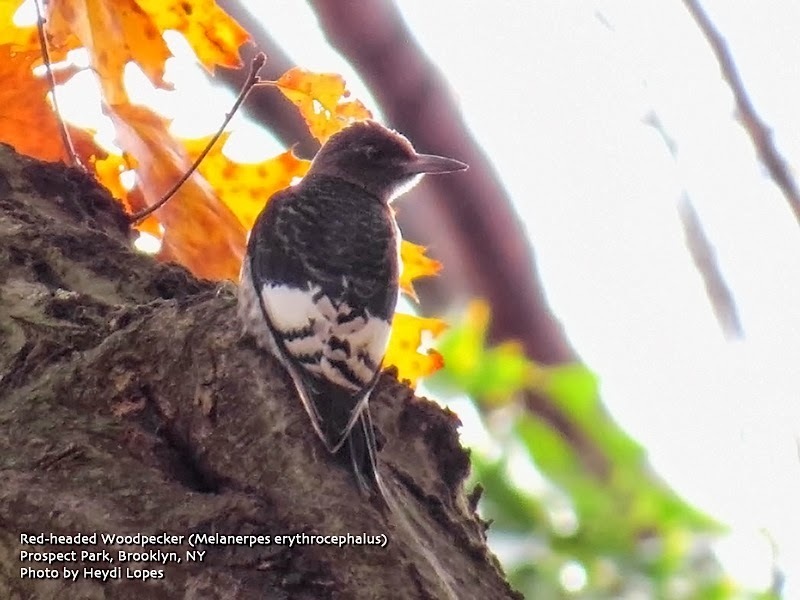 Unlike this immature bird, the adult red-headed is the only North American woodpecker with an entirely red head. This Fall this nomadic species is being seen in relatively good numbers around NYC, possible due to an unusually successful breeding season. The IUCN lists this species as "Near Threatened" with populations in decline. On Saturday I led a group of 15 birders to Floyd Bennett Field and Dead Horse Bay for the Brooklyn Bird Club. While we didn't find any particularly rare birds it was still a good day of spotting seasonal specialties and enjoying birding camaraderie. At the start of the trip I gave everyone a heads up about recent Cave Swallow sightings North, East and South of New York City. I followed up with a brief description of this small, rusty throated swallow normally found in Texas, Mexico, and the Caribbean. It is known to periodically wander into the Northeast, although I've never been fortunate to observe any in New York. There was a slim chance that, if any were around, we'd could see them in this coastal area. The group met at the Aviator Sports complex and from there my plan was to check the small field adjacent to Aviator, then walk to the Cricket Field and Return-a-Gift Pond. Skipping the 1.25 mile long East-West trail at the North 40, we'd return to the cars and head to the Floyd Bennett Community Garden after which we'd bird the overgrown baseball field at the end of Floyd Bennett Boulevard then scan Jamaica Bay for waterfowl. High-tide wouldn't be until 12:19pm, so after an early lunch we'd check the pilings near Archery Road for shorebirds. Here's a map of Floyd Bennett Field with the landmarks noted. On the walk to the Cricket Field, I spotted a Northern Harrier soaring in the distance above the North 40 (we would see another one later in the morning). Once at the Cricket Field, which is usually a good Winter spot to look for Horned Larks, American Pipits and the occasional Lapland Longspur, we found that there was only a single Killdeer on the field. As we watched it, I heard, then spotted a pair of American Pipits flying towards the field. They tentatively circled the field, changed their minds, then took off across Flatbush Avenue. On the weedy berm to our right was our season's first American Tree Sparrow. We only spent about a minute at the Return-a-Gift Pond as it was no longer a pond, but rather a mud hole devoid of birds. Backtracking passed the field, we were briefly captivated by the undulating, synchronized flying and landing of a flock of approximately 600 starlings. Our walk through the dozens of rows of small garden plots at the Community Garden was disappointingly quiet. Yellow-rumped Warblers were still fairly common, but the flocks of sparrows seen here over the previous few weeks were inexplicably absent. Perhaps the harriers, Cooper's Hawks and Sharp-shinned Hawks seen throughout the morning were keeping the birds wary and hidden away. The one area where there did seem to be a lot of birds was at the overgrown baseball field. I'm not sure why the field went unused this year, but it has become a magnet for Savannah Sparrows. When walking around the outer edge of the ball field, it seemed devoid of birds. As we began walking across the outfield, however, sparrows seemed to be popping up everywhere. We didn't spot anything other than savannahs, but what that area lacked in diversity, it made up for in quantity. Conservatively, there were 25-30 individuals around the field. After an early lunch we continued our birding with a brief stop along Jamaica Bay opposite Ruffle Bar. Rows of rotting wooden pilings and crumbling concrete supports with exposed rusting rebar are all that remains of an old pier near the current Coast Guard facility. Cormorants and shorebirds use this spot as a convenient roost during high-tides, when sandbars and mudflats in the bay are flooded by rising water. When we arrived there were a couple of dozen Black-bellied Plover and lower numbers of Dunlin sharing the spot with a flock of, mostly, Double-crested Cormorants. Just North of the old pier vantage point is a large, concrete parking lot that overlooks the bay. Large mixed flocks of gulls tend to roost here in the Winter, so we loaded our scopes back in the cars to go check it out. Driving along the old runways I decided to stop to scan the grasslands and watch a kestrel hunting over the fields. At one point this tiny, colorful falcon flushed a pair of Eastern Meadowlarks who had been hidden from view in the tall grass. The optimistic falcon seemed to think he could actually catch one of these bright yellow icterids, but given that they are nearly the same size, the chase lasted for only several seconds. The gull roost on the parking lot only held a small number of mostly Ring-billed Gulls, so we headed to the campgrounds known as "Ecology Village" to look for owls. I wasn't very hopeful of finding any as the conifers in this area have been dying off at an alarming rate. The park service hasn't been able to replant native pines fast enough. 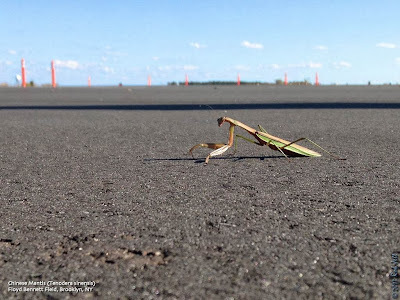 Anyway, it never hurts to look and a few people on the walk had never been to Floyd Bennett Field and I wanted to give them the full tour of where to look for birds. On Saturday there were very few birds around Ecology Village and no owls. I took a quick poll and, even after 6 hours of birding, the group still had plenty of energy left. We headed across Flatbush Avenue to Dead Horse Bay. There are three trails that traverse the mostly phragmite choked landscape between Flatbush Avenue and Dead Horse Bay, to the South-West. We took the Northern-most trail which exits onto the beach close to the Flatbush Marina. It is in this spot where an annual overwintering scaup flock assembles each year around this time. That flock can sometime grow to over 20 thousand individuals. Unfortunately, on Saturday the bay hosted exactly zero scaup. Our first Horned Grebe of the season paddled around a short distance from shore. By the time of the annual Christmas Bird Count I expect the grebe numbers to grow to a few dozen. Finally, other than several Buffleheads diving in the distance and a small flock of American Black Ducks nearby there wasn't really anything else of note on this small bay across from Plum Beach. On the walk back to the cars I spotted a small flock of Snow Buntings flying over Flatbush Avenue near the toll plaza. This mostly white, sparrow-like species passed us so quickly that there was little time to get the group on them. Snow Buntings are beginning to migrate through the area and can no doubt be found along New York City's barrier island beaches. But if we reduce, recycle, and urbanize, things might not be so bad. One of the unfortunate but inescapable consequences of population and economic growth has been the unabated proliferation of trash. The "Great Pacific Garbage Patch" has become as emblematic of our soaring waste output as have the millions of cheap, disposable goods that we've come to rely on. Every day, we generate over 3.5 million tons of solid waste—a tenfold increase over the past century. That figure will likely double again by 2025. On our current path, it could balloon to over 11 million tons per day by 2100, a tripling of today's rate, with sub-Saharan Africa fueling most of the growth. These worrisome projections, a group of authors argue in this week's Nature, underscore the already obvious need to balance future population growth and urbanization with more stringent waste reduction efforts. The authors based their waste production estimates on a model that blended socio-economic indicators like GDP and education with environmental parameters like energy use and climate trends. They considered 3 scenarios with differing populations and rates of urbanization. The lower the population and higher the urbanization rate, the lower the amount of waste we're expected to generate. The first scenario, or "Shared Socioeconomic Pathway" (SSP1), represents an idealized future in which fossil fuel dependency and resource intensity are significantly reduced and the 7 billion strong population is 90 percent urbanized. Furthermore, people are more educated and environmentally aware, and poverty levels in developing countries are at an all-time low. In this scenario, waste production peaks at about 8.4 million tons per day by 2075. SSP2 is the inevitable business-as-usual scenario in which not much has changed from the present day. Some progress has been made in curtailing emissions and income inequality, but the pace of improvement remains slow and uneven. In this scenario, the 9.5 billion population is 80 percent urbanized and produces 11 million tons of waste per day in 2100. Finally, SSP3 assumes a future in which the world is starkly divided among regions of extreme poverty, moderate wealth and bare subsistence. Little to no progress has been made in addressing pollution and other environmental problems, and global development goals have abjectly failed to come to fruition. Acute poverty and poor education converge to drive the population up to a staggering 13.5 billion, of which only 70 percent is urbanized. Yet, perhaps surprisingly, waste production increases by only 1 million relative to SSP2—to 12 million tons per day. Unlike SSP1, in which waste output plateaus around 2075, global waste generation shows no sign of slowing, even by 2100, in the latter 2 scenarios. While the model only goes to 2100, it seems likely that there is still room for growth past that in both SSP2 and SSP3. Following these calculations, the authors decided to use SSP2 (business-as-usual) to help them assess how the rate of waste generation would vary by region between the present and 2100. The seven broadly defined regions they considered included sub-Saharan Africa, East Asia and the Pacific, Europe and Central Asia, South Asia, Latin America and the Caribbean, the Middle East and North Africa, and a large group of high-income countries. While the US and other developed countries still account for a sizable proportion of global waste production, East Asia currently represents the locus of growth. China's output alone, which now exceeds half a million tons per day, could mushroom to around 1.4 million tons per day by 2025. Between 2025 and 2050, South Asia, led by India, is expected to take the lead. After 2050, sub-Saharan Africa surges ahead and, by 2100, is responsible for the production of about 3.2 million tons of waste per day—almost a third of the global total. One of the authors' central points is that the volume of trash a population puts out stabilizes or even declines as it becomes wealthier and more urbanized (as does the size of the population itself). This is hardly a novel idea, but here it is backed up by the results of their model, which sees waste generation plateau or begin to do so by 2100 in all but South Asia and sub-Saharan Africa. It's truly a testament to the fact that there are no easy solutions to this global dilemma that most of the remedies that the authors suggest—recycle more, reduce consumption, and be more efficient, among others—have been part of the conversation for decades. They approvingly cite San Francisco, California, and Kawasaki, Japan, both of which have already managed to reduce their waste output by well over half, as examples of what other cities in developed countries should strive for. But the real challenge lies with developing countries. Improving waste management or urban density is one thing. But it's quite another to discourage consumption in countries like China and India, where rapidly growing middle classes want to consume more. The greatest potential for change could reside in those developing nations, particularly in Africa, that still have relatively low urbanization rates and are plagued by high poverty and inequality. With the right education and incentives, they could be encouraged to embrace sustainability—both as a way of life and as a tool of modernization. Click here to learn about the workshop. Saturday, November 16, 2013, 10:00 a.m. to 2:00 p.m.
Meet in the Nevada Avenue parking lot at High Rock Park. We will join other Greenbelt volunteers removing invasive plants. Protectors will supply tools, gloves and refreshments. If there is interest, after the work session (our 208th monthly workshop) we will take a short walk over nearby trails. The NYC Parks Department has invited the Queens County Bird Club to lead a winter bird walk at the newly reopened Ridgewood Reservoir. After ten years closed to the public, we will explore this reclaimed hidden gem in Queens, thereby showing that we as birders support passive recreation. Not only does the reservoir have great birding possibilities, but an interesting history as a former part of the city's water supply system. Meet at the parking lot in Highland Park on Vermont Place just south of the Jackie Robinson Parkway. Mary Normandia, leader. 516 965 2282. 1 - Register. Let leaders know you're coming! 3 - Be advised if there are last minute changes or cancellations. These cannot be communicated to unknown persons. 4 - Be on time! Most trips begin birding by 8am! 5 - Please arrive before the starting time so we do not waste precious early morning bird activity. 6 - Plan your travel time. Mary Normandia from the Queens County Bird Club will lead a nature walk around the Ridgewood Reservoir in search of winter birds. Binoculars recommended. We offer birding programs throughout the year and our Exploration series focuses on unique wildlife viewing opportunities during particular seasons. Free! Discover the plants and animals that inhabit the urban forest on the Nature Exploration Hikes. Greetings. This is the New York Rare Bird Alert for Friday, November 8th, at 7:00pm. The highlights of today's tape are CAVE SWALLOW, AUDUBON'S YELLOW-RUMPED WARBLER, NORTHERN SHRIKE, POMARINE JAEGER, MANX SHEARWATER, HARLEQUIN DUCK, EURASIAN WIGEON, AMERICAN GOLDEN-PLOVER, DICKCISSEL, LAPLAND LONGSPUR, CLAY-COLORED SPARROW, and RED-HEADED WOODPECKER. It was nice having the New York State Ornithological Association's annual conference in our area last weekend, but unfortunate that the weather wasn't more cooperative. A coastal flight of mostly robins and blackbirds Sunday morning did also include some TREE SWALLOWS, and along with them were noted a few BARN SWALLOWS, a NORTHERN ROUGH-WINGED SWALLOW, and also the season's first CAVE SWALLOW, this at Robert Moses State Park. CAVE SWALLOWS have so far been quite scarce in the northeast, but hopefully more will follow. Another CAVE SWALLOW was seen today, with TREE SWALLOWS, at Jones Beach West End this afternoon. Another unusual bird for the weekend was an Audubon's form of YELLOW-RUMPED WARBLER reported from a fragment of the old Hempstead Plains in Uniondale on Saturday. At that location Sunday were a VESPER SPARROW and three late BOBOLINKS. A NORTHERN SHRIKE had the bad timing of waiting until Tuesday to appear at Jones Beach West End, seen west of the West End 2 parking lot, where it reappeared today until lost from view as it moved east past lot #2. Saturday at Jones Beach West End, an immature AMERICAN GOLDEN-PLOVER joined over 300 American Oystercatchers, 74 Red Knots, and other shorebirds on the sand island off the Coast Guard Station, and three ROYAL TERNS were at Jones Inlet. 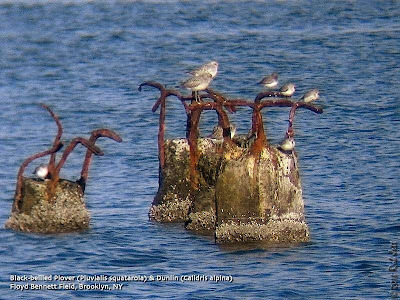 The Roosevelt Nature Center added a LAPLAND LONGSPUR and three VESPER SPARROWS, all seen from the boardwalk, and a LESSER BLACK-BACKED GULL was at Jones Beach field 6 on Sunday. Another LAPLAND LONGSPUR was noted at Robert Moses State Park Sunday, when five COMMON EIDERS were spotted offshore. One or two EURASIAN WIGEON were seen over the weekend at Massapequa Preserve, usually present on the pond, east of the eastern end of Pittsburgh Avenue. Another EURASIAN WIGEON appeared on the East Pond at Jamaica Bay Wildlife Refuge today, along the northeast side of Pond. A WESTERN SANDPIPER was on the East Pond last Sunday, joined by a second one on Tuesday. Continuing their good recent run, other VESPER SPARROWS included singles last Saturday at Kissena Park, the Bronx Botanical Garden, and Soundview Park in the Bronx at Turtle Cove, and Pelham Bay Park, while Saturday and Sunday found five VESPER SPARROWS continuing on the Parade Ground at Van Cortlandt Park in the Bronx. Also at the Parade Ground were 45 AMERICAN PIPITS and an EASTERN MEADOWLARK on Sunday, and a CACKLING GOOSE on Thursday. Two RED-HEADED WOODPECKERS were still in the Turtle Cove area of Pelham Bay Park Saturday, at least one Tuesday, and other RED-HEADEDS were at Kissena Park Saturday and Prospect Park Sunday and Monday, Green-Wood Cemetery in Brooklyn Monday, and at Muttontown Preserve today. 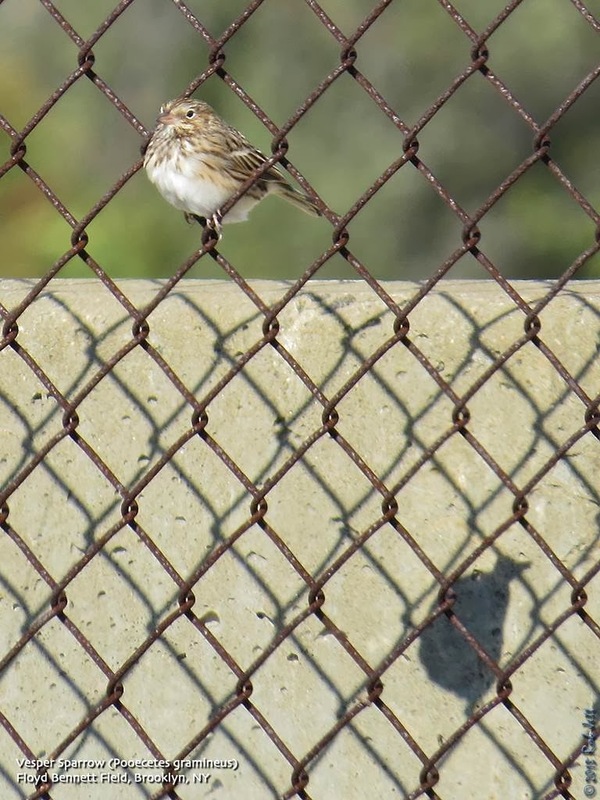 CLAY-COLORED SPARROWS were spotted at Sunken Meadow State Park Monday and at Marshlands Conservancy in Rye on Tuesday. A DICKCISSEL was at the Cemetery of the Resurrection on Staten Island Sunday to Tuesday. A hawk watch on Sunday at Inwood Hill Park in northern Manhattan recorded a dozen or more BALD EAGLES, some RED-SHOULDERED HAWKS, and 70 SNOW GEESE moving south. NELSON'S SPARROWS remain fairly common in appropriate salt marshes, both on the south shore of Long Island and along the Westchester coast. Dune Road west of Shinnecock Inlet seems to be quite reliable for them now. NELSON'S was also reported at Randall's Island this week and last. Other birds noted at Shinnecock Inlet last Sunday recently featured a HARLEQUIN DUCK, five PARASITIC JAEGERS, and two ROYAL TERNS. Farther east on Long Island, a sea watch at Amagansett Saturday produced a POMARINE JAEGER a MANX SHEARWATER, and 17 CORY'S SHEARWATERS. 43 BLACK SKIMMERS were still at Mecox last Friday, and in the Montauk area a CACKLING GOOSE was with Canadas at Deep Hollow Ranch, and BLUE-WINGED TEAL and PECTORAL SANDPIPER were at Rita's Horse Farm. Unexpected was a calling flyby PECTORAL SANDPIPER in Prospect Park on Monday, only ~5th record in the park's history. Generically referred to as the "Praying Mantis", this Chinese Mantis is one of two mantid species introduced to North America in the 1800s. 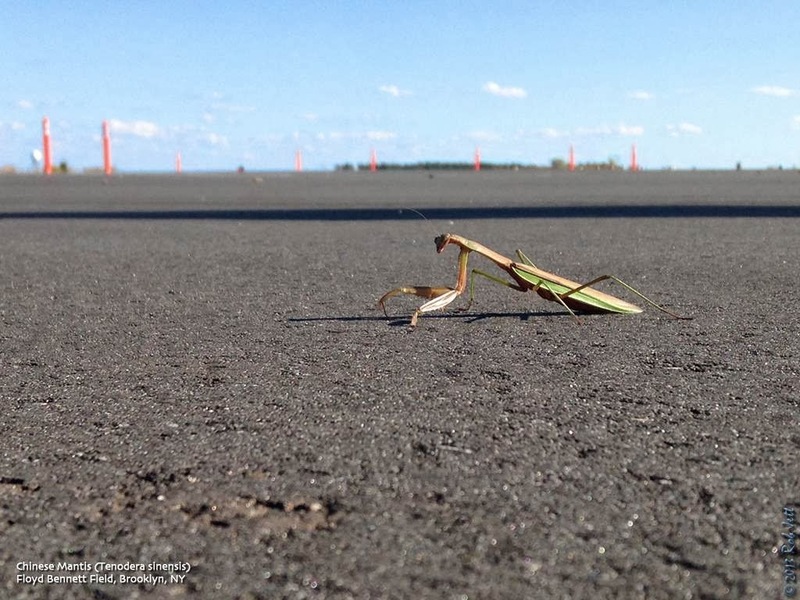 The other is the European Mantis. Both were introduced to control pest insects from ravaging crops. It's unclear if that strategy worked, but they do frequently get eaten by birds (and occasionally attack hummingbirds). The month of October didn't yield any big surprises, bird-wise, although there were a couple of unexpected "pop ups". I had all but given up on finding Connecticut Warbler early in the month and decided, instead, to check for waterfowl along Coney Island's beach, as well as, Coney Island Creek on the North side of the peninsula. After walking from the beach at Stillwell Avenue to the Western-most jetty that is the boundary to the private community of Seagate, I headed North on West 37th Street towards Gravesend Bay and the creek. As I approached a vacant, weedy lot at the South-East corner of Mermaid Avenue it occurred to me that it would be a good spot to find a vagrant flycatcher. I stopped briefly to scan the area. An olive-green and yellow warbler was walking in the grass. It flew out of the small field to a puddle at the edge of the curb where several sparrows had gathered to bathe and drink. I stared in disbelief at the warbler - a Connecticut Warbler. This normally shy, not easily seen species was standing at a puddle with several House Sparrows at the side of the roadway. Back in October of 2004 Peter D., Tom S. and I experienced an even more cooperative Connecticut Warbler in Sandy Hook, NJ. Presumably, birds that behave in this manner are too tired and hungry from migrating to waste energy fleeing from humans. As the pace of sparrow migration picked up, I made a couple of trips to the coast to look for marsh sparrows. Finding Nelson's Sparrow turned out to be relatively easy and I had already found Saltmarsh and Seaside Sparrows. The normally scarce Vesper Sparrow ended up being fairly common around Brooklyn this season with 5 personal sightings. The scarce Lark Sparrow, which has appeared in numerous locations around NYC this Fall, still eludes me, as do the rare Le Conte's and Grasshopper Sparrows. When I first started birding, the grasslands at Floyd Bennett Field were the go-to spot to find migrating or overwintering Short-eared Owl. Now listed as "Endangered" in New York State, they are very rarely seen at this location. My guess is that disturbance from human activity (especially helicopters over the fields) and a diminishing prey base due to the increasing feral cat population here plays a big role in their disappearance. That bad news aside, Bob, Heydi, Tom and I spotted one at Floyd Bennett that was sitting on the shore at the edge of Jamaica Bay when I inadvertently flushed it. Historically November is the month when unusual vagrant species show up around New York City and Long Island. With a little luck, my next installment of monthly sightings will include some really exciting finds. The story of Detroit is a familiar one for anyone living in the so-called rust belt of the USA, where the once-mighty automotive manufacturing industries have left many towns and cities shadows of their former selves. Now bankrupt, Detroit’s population has halved over the last fifty years. No one actually knows just how many buildings are abandoned, but it is estimated at over 1/3 of all structures. In the midst of this urban decay, farming has started to fill the hole left by industry. Local businessman John Hantz just bought 600,000 square meters of land from the city of Detroit with an option to buy an additional 700,000, promising to demolish all the existing (abandoned) buildings, clean up the land, and plant hardwood trees. The Bank of America announced plans to demolish 100 homes and donate the land to urban agriculture. They’re not alone, as other small-scale urban farmers are adapting what’s left of the city to meet their needs. Detractors are quick to point out that urban farming will never be a large-scale, mass-produced operation that could compete with big agriculture, but urban farmers have a different goal in mind. 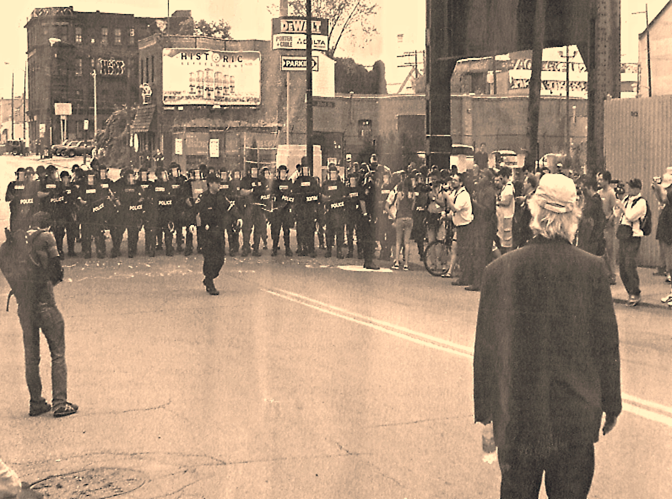 Greg Willerer of Detroit says that he isn’t trying to save the world, just to save his city.